Despite the fact that the majority of college students are probably more concerned about finding a job than about retiring, the MIT College Democrats held a Social Security forum Sunday in 6-120. U.S. Representative Michael Capuano (D, Somerville) headlined the event. Brandi Fisher, a representative from Americans Discuss Social Security, Susan Harding, the Deputy Regional Commissioner of the Social Security Administration, Bob Hannon, the New England Regional Director of the Concord Coalition; and Hillary Wenner from the regional office of Economic Security 2000 also spoke. Capuano discussed his views regarding the imminent problems facing social security, before he gave the floor over to the other speakers, all experts in the field of social security reform. Speakers at the forum expressed the common desire to engage citizens in the democratic decision-making process. "Think about it. Talk about it. This social security program is your program not a program for the government. An educated, thoughtful public is the most important thing we in Congress can stress. 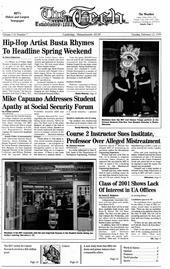 If there is one issue that deserves a national debate it is social security," Capuano said. The speakers also emphasized the effect social security reform will have on the young people of today. Unfortunately, according to Capuano, people in their 20s have been shown to be the least likely to vote and become involved in the political process. "It is vitally important for the college students of America to become aware of the reform options surrounding social security, as it is these people who will be affected by the changes in the system," Capuano said. "The apathy and lack of knowledge concerning the issue of social security by most college students is striking," Fisher said. Attendance at the forum was fair, but typical of these kind of events held at other college campuses, according to Fisher, who travels around the country talking to students and hosting political discussions. The speakers also outlined problems facing social security in the future as well as the current solutions being considered by Congress. "The primary concern of politicians, economists, and social security experts is the �aging' of America. As the United States edges toward the year 2000, the number of people over 65 is dramatically increasing. The fastest growing age group in America is those over 85," Hannon said. Since the program's inception, the Social Security Administration has been collecting a surplus of funds in order to build a reserve trust fund. The SSA created this trust fund so enough money would be available to provide the baby boomer generation with social security benefits. The SSAwill be forced to begin using this reserve fund in 2013 due to the increasing number of retired Americans. By 2032, the funds in this account will be exhausted. A number of responses have been mounted by different groups to this impending crisis, but as Capuano said, "There is no single answer to this problem." Some politicians have advocated an increase in the retirement age, but this short-term remedy has been met with significant opposition from special interest groups including the American Association of Retired Peoples. MIT-CDS organized the forum as part of their mission to increase political awareness on campus. Aaron B. Strauss '02, MIT-CDS co-president, served as master of ceremonies for the forum. "We held this forum because social security is a hot issue in Congress right now which significantly affects young people," said Areej Hassan '99. This political forum was not the first organized by MIT's College Democrats. Last year, Scott Harshbarger, a Massachusetts gubernatorial candidate in 1998, and Robert Reich, former U.S. Secretary of Labor, spoke at MIT. Strauss considers MIT-CDS a fairly active group of about ten core members. "The primary goals of the College Democrats are to educate MIT students about current political topics and encourage them to vote. We are in the process of planning for a voter registration drive in the spring," Strauss said. The group meets monthly to plan for future events and write letters to members of Congress.